Three books were in the front of my mind while writing. Eamon Duffy’s Stripping of the Altars (1992) and Brad Gregory’s The Unintended Reformation (2012) helped shape the way I think about the Reformation cataclysm, while Peter Lake’s The Boxmaker’s Revenge (2001) has been a model for how to think and write about public religious disputes and the politics of religion. Researching this book took me to about four dozen archives, many of which I had never visited before. More importantly, my work in those archives led me to sorts of manuscript material that I had not used in earlier research, especially marginalia and rough drafts of published work. Those manuscript resources enabled me better to work out how eighteenth-century authors crafted and pitched their works and to whom they intended to pitch them: that would have been impossible using just published materials. The most enjoyable part of writing this book was meeting and getting to know some really interesting scholars I’d not met before. I learned a lot from our conversations, and the book is the better for it. Organization. I struggled for a long while trying to figure out how to structure the book. In the end, I decided to mimic the structure of William Faulkner’s The Sound and the Fury, which is to say that I tried to tell much the same story from four different perspectives. 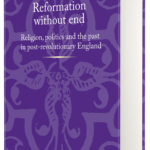 So, Reformation without end has four sections which come at the same story from four distinct, yet overlapping, vantages. 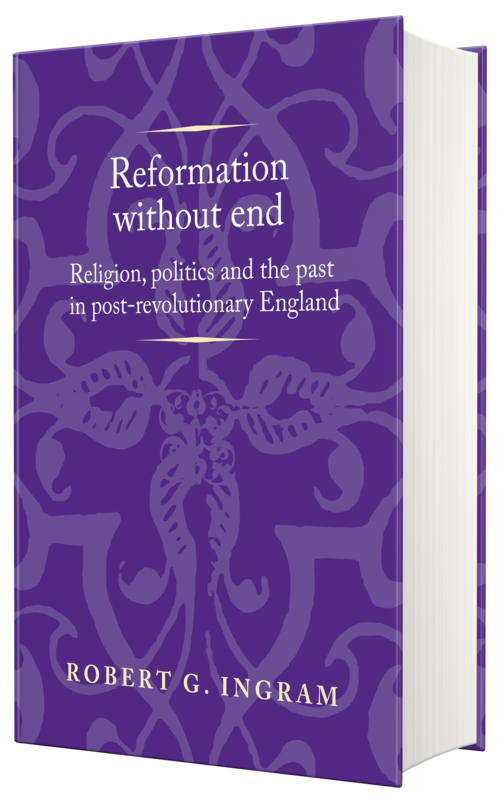 My first book was called Religion, Reform and Modernity in the Eighteenth Century (2007), and it was about the religious reform movement associated with a mid-eighteenth-century archbishop of Canterbury named Thomas Secker (1693–1768). I’ve also been involved in some edited collections including (with William Bulman), God in the Enlightenment (2016). I couldn’t believe it was real. And I was so relieved that it was done. When I got the first copies of Reformation without end, I felt exactly the same way. The Politics, Culture and Society in Early Modern Britain series is a great series, and I have been influenced by the work of its editors, especially Peter Lake, Jason Peacey and Anthony Milton. So, I was really pleased that my book could come out in a series that they edited. Moreover, I have always been impressed with the production value of MUP’s books: having now seen up close how the press treats authors and their book manuscripts, I understand why the final products have those high production values. My first book was a heavily revised version of my PhD thesis. While I did the revisions after I started a full-time academic job at Ohio University, most of the research for that first book got done while I was a graduate student and I was revising something, a PhD thesis, that I’d already written. Reformation without end got researched and written from scratch while teaching and starting up a center at my university. It all proved more difficult to pull off than I’d originally imagined. I’m starting to research a book project I’m calling Hobbes’s Century: England, Ireland and Religious Establishment, 1689–1742. My take is that the eighteenth-century British talked like Lockeans but acted like Hobbesians, especially where religion was concerned. Hobbes’s Century book will be explore that tension. I’m also working on an edited collection with Jason Peacey and Alex Barber called The Freedom of Speech, 1550–1850. Robert G. Ingram is Associate Professor of History at Ohio University. 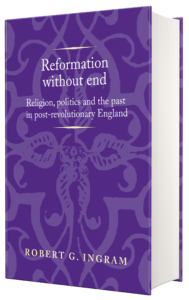 Reformation without end is available now. Read a sample chapter here.